Ecuador – 5 Things to do! What makes Ecuador such a phenomenal travel destination is the fact that within this relatively small country you’ll find a plethora of different natural, historical and cultural attractions? The mighty Andes, the magnificent Amazon, UNESCO-listed treasures and more wildlife and wilderness than you can imagine. Even just a two-week jaunt through Ecuador can gift you an array of unforgettable moments, discovering some of South America’s most astonishing highlights. Ecuador is a vibrant country with startling colours, indigenous villages, snow-capped peaks and awe-inspiring volcanoes. It is adorned with luscious rainforests brimming with endemic wildlife. It is home to an incredibly endearing culture, and has endless stretches of beautiful beaches with fantastic surf. As far as comprehensive and enticing South American countries go, Ecuador’s right up there among the very best. Tight for time and want to squeeze the life out of your next visit to Latin America? We present you Ecuador – 5 must-Do! A remote volcanic archipelago set smack bang on the equator, around 600miles from mainland Ecuador, the Galapagos consist of thirteen large and six smaller islands. Each has a diverse and unique landscape ranging from moonscape “out of this world” volcanic lava fields, to lush forests and idyllic white sandy beaches. If you’re looking to get up close and personal with some of the world’s most unique wildlife, then the Galapagos Islands are the place to visit. This is one of South America’s BIG Five which should be firmly included in your travel bucket-list. From the moment you set foot on the islands, you can’t fail to be overwhelmed by the sheer number of unique creatures. 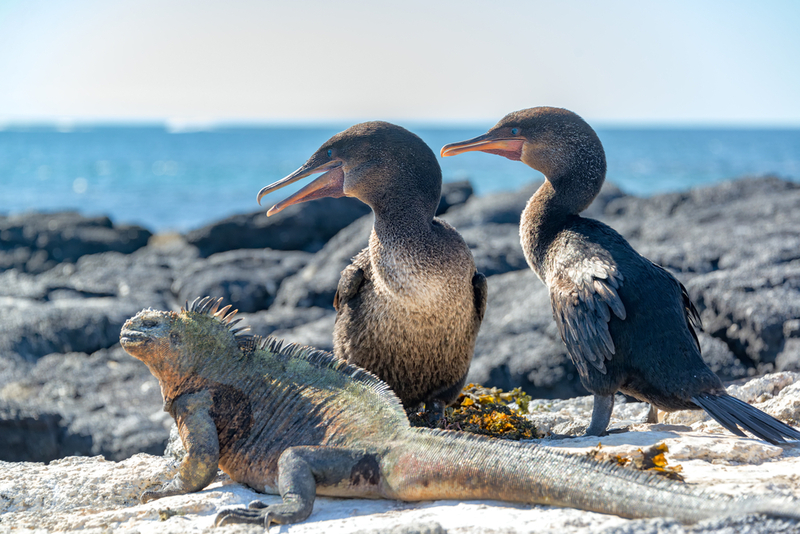 Marine iguana, giant tortoise and flightless cormorant just the tip of the enormous wildlife-iceberg of the Galapagos. There really is nowhere quite like it on earth. Taking a cruise is the ideal way to see the Galapagos, but don’t think you will be sitting back sipping cocktails with nothing to do. One day may consist of swimming with inquisitive sea lions or heading on a hammerhead shark spotting mission, the next meeting the world’s largest giant tortoise in the misty highlands. There can be as many as 750,000 birds inhabiting the islands; you can see anything from comical Blue Footed Boobies performing their foot stamping courting ritual, to the world’s most northerly penguins. Include an extra night in Santa Cruz so you can visit the fish market. Everyone comes here for dinner! Watch the pelicans shiver with anticipation and the sea lions look longingly as fishermen prepare and haul in their catch. Grab yourself a table at a nearby restaurant, sit back and enjoy the spectacle of man vs seal vs pelican. 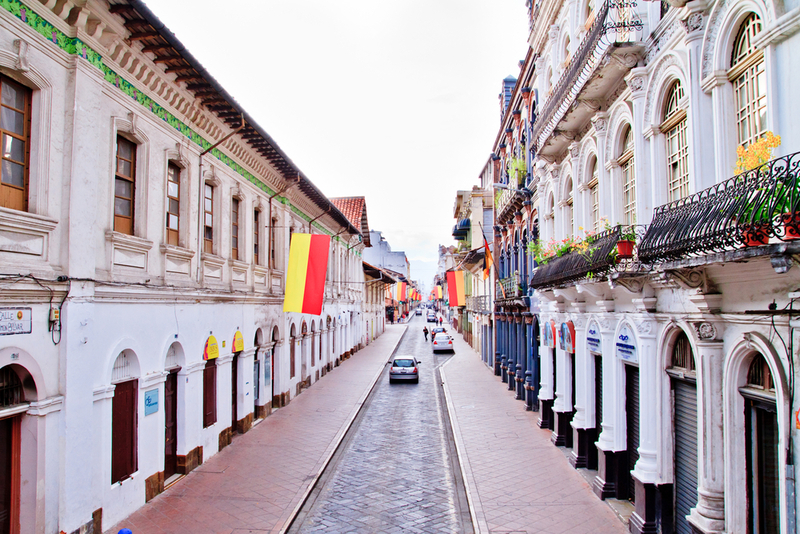 One of Ecuador 5 Must do is visiting the historic city of Cuenca, an included stopover on all Classic Ecuador tours. Strolling around this beautifully preserved colonial city, you could be forgiven for thinking you have stepped back in time. Cobblestone paths lead you down charming narrow streets where cafes and galleries are tucked away amongst the whitewashed houses. Red-tiled roofs, soaring spires and striking domes dominate the skyline, while 16th Century colonial buildings, churches and plazas line the lively streets. There are enough churches in Cuenca to visit a different one each Sunday of the year, but if you only have time to visit one then make it the enormous Cathedral of the Immaculate, instantly recognisable by its beautiful blue domes and stunning Spanish stained glass windows. You can admire the church’s impressive facade from the pretty tree-filled Calderon Park, the city’s main plaza, where locals and tourists alike come to escape the afternoon sun. Enjoy an ice cream, relax and watch the world pass by. If the distractions of the park aren’t enough, you can even get free wifi here. A short walk from the park is the Plaza de las Flores and the outdoor flower market. This small marketplace is bursting with colours, and a delicious, heady fragrance fills the air with hundreds of blooms. See the traditionally clothed local women sell armfuls of Arum lilies, giant roses, and exotic orchids. This is an incredible treat for your senses. Ready for some retail therapy with a difference? Then visit one of the Panama hat factories. Contrary to their name, these jaunty hats are actually from Ecuador. Visit the factory and you’ll get to see how they make the hats from grass and, of course, you can buy one to take home as a souvenir. Ready to eat after all the shopping and sightseeing? You’re in luck! Cuenca is the best place in Ecuador to eat “cuy”, better known to some as the humble and cute Guinea Pig. The Avenida Don Bosco is a good place to see the little fellas roasting on a spit, even if you don’t feel adventurous enough to try one. Set high in the Andes and nestled in a valley and surrounded by snow-capped peaks, Quito grants breathtaking views at almost every turn. But tear your eyes away from the dramatic mountain scenery and you won’t be disappointed with what you see. 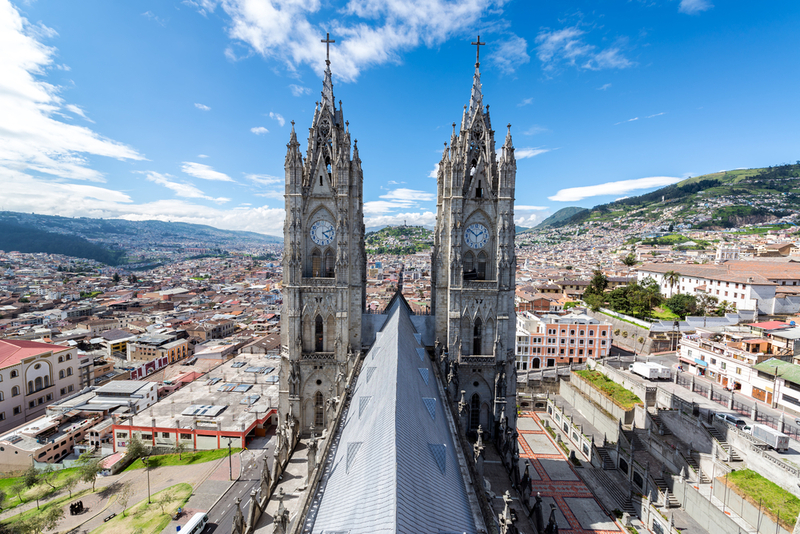 Quito’s “Old Town” was granted UNESCO World Heritage status in 1978, and for good reason. The city is bursting with architectural gems and is one of the best preserved historical centres in all of Latin America. Visit the Church of Iglesia de La Compania de Jesus, by far the most ornate of the 40 odd churches in Quito with its incredible baroque gold-leaf altar. Locals like to boast that is the most beautiful church in the country and they could well be right. The enormous Basílica del Voto Nacional stands on a hill overlooking the old city and dominates the skyline. This is not your typical Cathedral; instead of gargoyles, you’ll see a puma, turtle and iguana project from the church walls. If you’re feeling energetic climb the tower for unrivalled views across the city. Wander the narrow cobbled streets to absorb the buzz of the place. Plazas are filled with colourful locals, restaurants and street vendors, and It’s easy to lose yourself in the atmosphere and (quite literally) on the streets as they twist through the town Make sure you pick up a map of the city before heading out, to explore Old Town. When you have had your fill of culture, kick back and people watch in Plaza San Francisco one of the many picturesque plazas. Order yourself a hearty Locro de Papa soup with coffee on the side and breathe in some of that colourful South American essence. The lungs of our planet, the most biodiverse wilderness area in the world and Latin America’s most revered gem. The Amazon is all that, and then some. Just a short plane-ride from Quito is where you can immerse yourself in the Ecuadorian Amazon basin in Coca. The flight itself is out of this world and sees you climb up and over some of the highest peaks in the Andes. Seeing mighty Cotopaxi Volcano fuming his top is a regular occurrence, and adds to the amazing Ecuadorian Amazon journey experience. 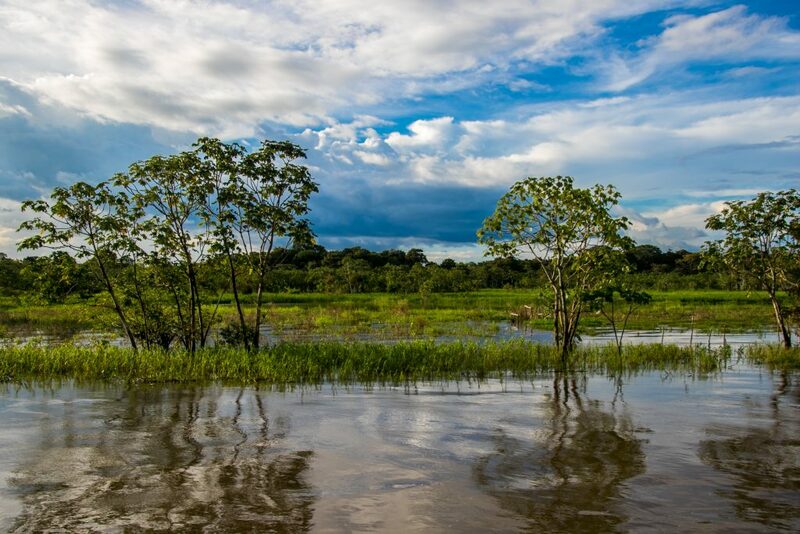 On a multi-day Amazon adventure trip you’ll set off on canoe rides along tributaries teeming with wildlife, both in the water and on the banks of the rivers. You’ll hike through the thick forest floor in search of insects like tarantulas, spot lonesome sloths doing not much at all, and learn all about the medicinal plants local indigenous communities still use. You can go fishing for piranhas, swing from jungle vines and play Tarzan in a way you’d never imagine. More than anything else, however, you’ll have the priceless opportunity to switch off the modern world and all the stresses that come with it. You’ll be at one with nature and will gain a completely new perspective on this incredible planet in which we live. The Amazon, by the way, is also an ideal family holiday destination. If you’re looking for a journey with a difference, one that will change your view on the world, this is arguably the one to take. 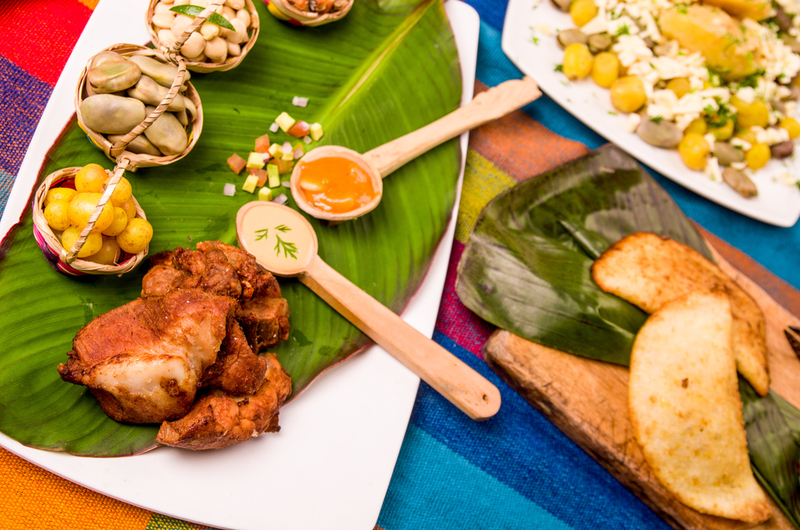 Ecuadorian delicacies rate as some of the country’s very best highlights, and that’s saying a lot considering the extensive array of UNESCO-listed treasures and magical places you can visit. But hey…the taste buds also need a break for the ho-hum of everyday life, right? Travel to Ecuador and you’ll be taking your taste-buds on an exciting and delectable adventure. Local cuisine changes dramatically as you travel through the regions, with geography and soil fertility adding to the intoxicating mix of ingredients. In the mountainous regions menus rely heavily on meat and carbohydrates (you’ll need the extra energy, trust us), including the above-mentioned Guinea Pig, chicken, pork and beef. Potatoes, corn and rice are staples throughout the country, as is plantain, which is normally grated, fried and served alongside most dishes. Popular street snacks to look out for are hornado (a mouth-watering potato and roast pork dish), llanpigacho (grilled potato patties that go well with just about everything) and humitas (Ecuador’s version of the corn and onion tamale is the best, because it’s filled with cheese and steamed rather than boiled). We have a host of amazing Ecuador tours on offer, all of which will help you experience this incredible and too-often overlooked South American country. Chimu Adventures can create your next unforgettable Ecuador adventure. Click here for more information about Chimu.